For me, reading a good book is bittersweet. For all the glorious escape a good book offers, the new worlds and insights, and the new friendships gained along the way, there is always that lingering knowledge that all good things must come to an end. Certainly, one can reread a book, but it is never quite the same. Even on those occasions when a book is even more enjoyable on the second or third read-through, it remains a separate and completely isolated experience from the first reading. It might be a new relationship with an old friend, but the breakup at the end is no less devastating. A good book is like your first trip to Paris. It’s incredible. Exhilarating. Momentous. There’s nothing quite like it. But the Eiffel Tower will never look quite the same again and the magic you felt roaming through the Louvre will be different next time. The magic will still be there, but it won’t have precisely the same… timbre. That doesn’t mean the experience is any less worthwhile, instead it makes it all the more special - an ephemeral adventure into another world that changes your own forever. That boy you meet sitting in the Luxembourg Gardens, the one reading Madame Bovary with a furrowed brow, and who kisses like your mouth is the first strawberry of Summer. The one who takes you home and shows you what it really means to make love. He changes the way you see things forever, but you both know that once the week’s up, he’ll go back to his real life and you’ll return to the other side of the world. 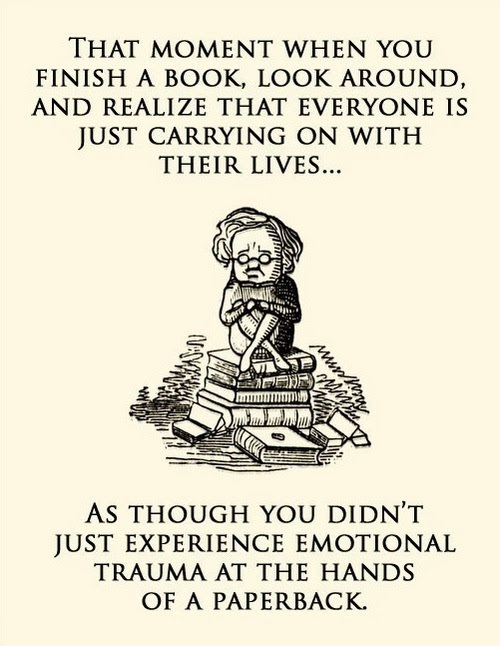 That’s how it feels to read a good book. A good series is even worse (or do I mean better?). Instead of a week in Paris, you spend a month… or maybe three. You get to know the way the city moves and breathes, and you discover the tiny mole midway up that boy’s thigh. You learn to love his tiny apartment and the way he hums first thing in the morning, even while you’re still trying to sleep. So when the calendar finally ticks over and you have to head home, you try and fail to restrain your tears at the airport, because both of you know it’s over - it’s time to put down your book and return to the real world. Of course, to grossly butcher Tennyson, it’s better to have read a book and finished it, than to have never read it at all. 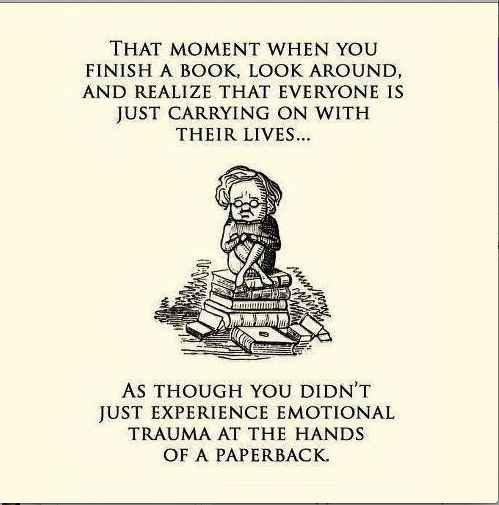 Which books or series have left you feeling heart broken as you turned that final page? Ooooooh! Now I have to add the Sundering Series to my never ending to-be-read list!!! Though I don't cope well without my HEA. Your feelings for it reflect my desperate attachment to so many stories, including your own. I've been trying to remember the first time I felt this way about a book, but I think my life has been one giant rollercoaster driven by book after book ripping my heart out. And I wouldn't have it any other way!